It is Christmas time, so more than ever, education should prepare students for glocal civility and peace. So what in the world are we educators waiting for? Good educators know that the real world is even more interconnected and interdependent. We all share in facing global poverty, global economic recessions and trade imbalences. On the other hand we all share opportunities for global collaborations and international cooperation. These challenges and opportunities define the contours of our lives, even in their most local dimensions. So the moment is now and here, let's give our students the opportunity to become more globally competent and prepare them for life in the real world in their communities and societies. To do so, I present below a very simple project to enhance students global competence which I call The Cooperative Christmas Tree and I will describe in the lines that follow some ideas on how to implement that in your institution. 1) Visit a local public day care center, orphanage or rest home and tell the person in charge of the administration that you intend to develop a Christmas collaborative project there. As soon as you get the supervisor's autorization, the next step is to explain your project to the institution residents and ask them to write a letter asking for something they would like to be given on Christmas' Eve. 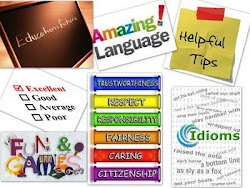 You will get surprised by the things they usually ask, the elderly they will go for items for personal cleanliness, like shampoo, hairbrush, tooth brush and the kids choose school material items and toys. A few number of the participants may ask costly items but they are exceptions. 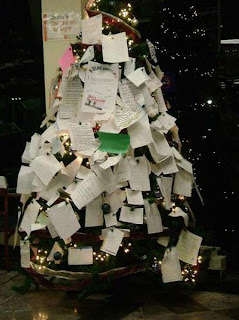 2) The next step now is to assemble a Christmas tree in your school or a local institution and hang on it the letters. The idea is invite people to adopt one of those people and buy what is requested. It is also nice to ask them to write a Christmas card. 3) Before Christmas evening you should invite some of the people who took part in the project and go to the institution you chose to give the gifts. This moment is magic, seeing in those people's eyes how thankful they are is priceless. We feel like we can make our slight share to help the world! It's a magnificent experience. So, I invite you now to try this out in your school or local institution and share this moment! If you have any questions on how to implement this project, don't hesitate in contacting me.